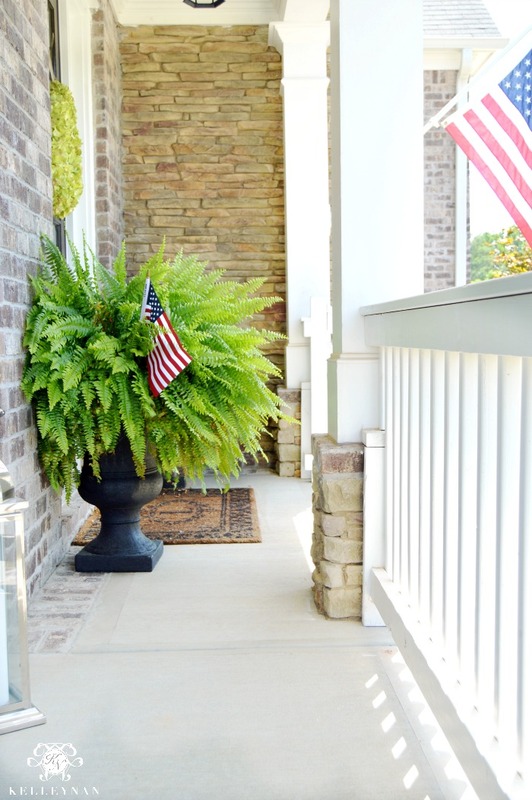 …and our front porch (HERE) got a little patriotic face lift for the holiday, too. But today, I would like to welcome you to head out back to our party deck. 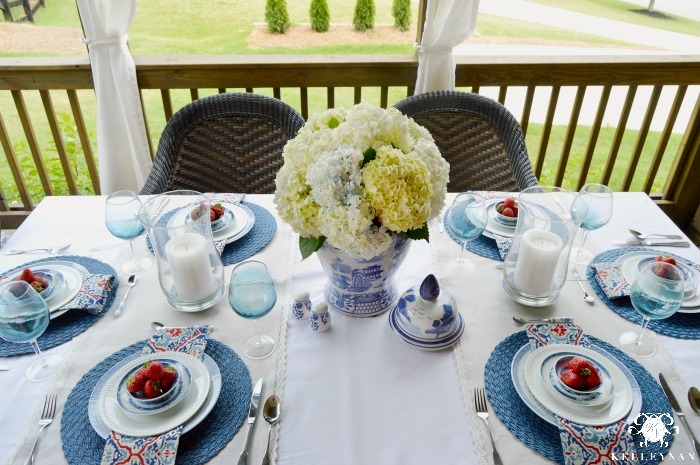 We have several seating areas positioned around the deck- the table and chairs under the covered portion, a bistro table shaded under an umbrella, and then a pair of loungers at the furthest point. I’ll be honest- in the evenings, this is the perfect place to relax but on days like this, which I seriously think may deserve a new descriptive phrase as even “hotter than Hades” doesn’t seem to quite do it justice, well, my poor little plants can give you an idea of how it feels. In the above 100 degree temps, it’s a little tough but once the sun starts setting, all that coleus perks right back up. 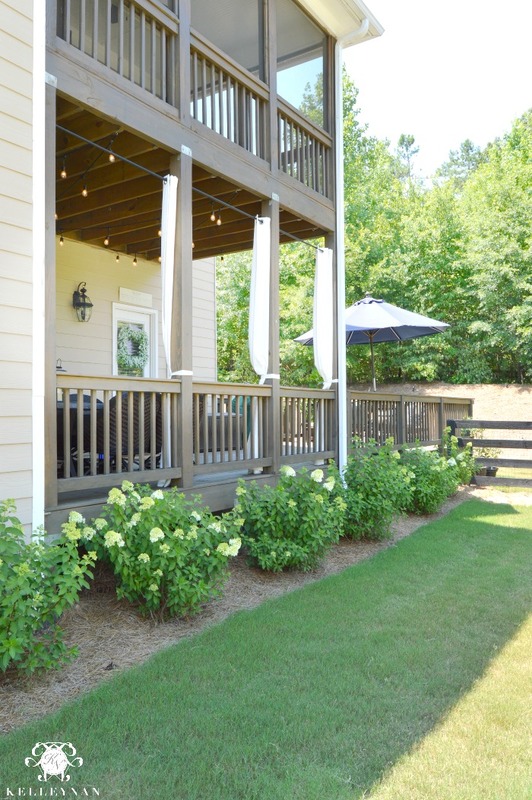 In the Georgia heat, cool refreshing snacks and hydrating beverages are a MUST. 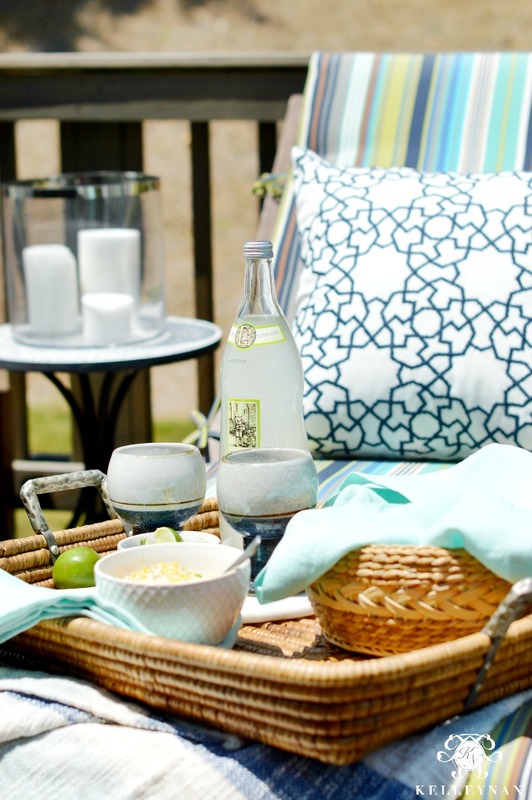 If you aren’t from the south, yes, all the rumors you hear are true – sweet tea, lemon/limeade are summertime essentials. 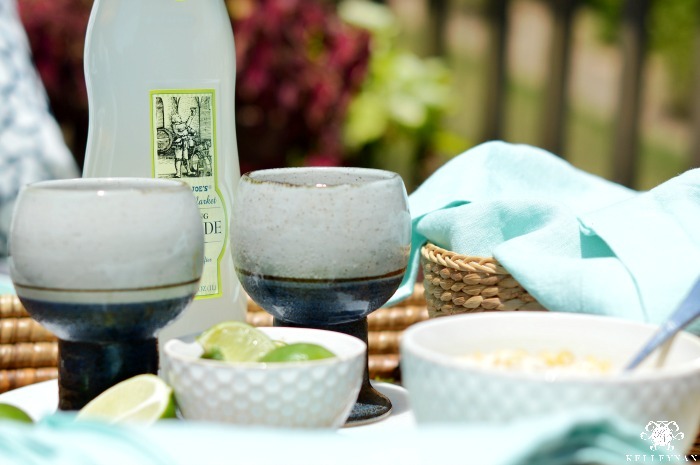 For this “heat-stroke-esqe” weather, I whipped up my favorite summertime appetizer. 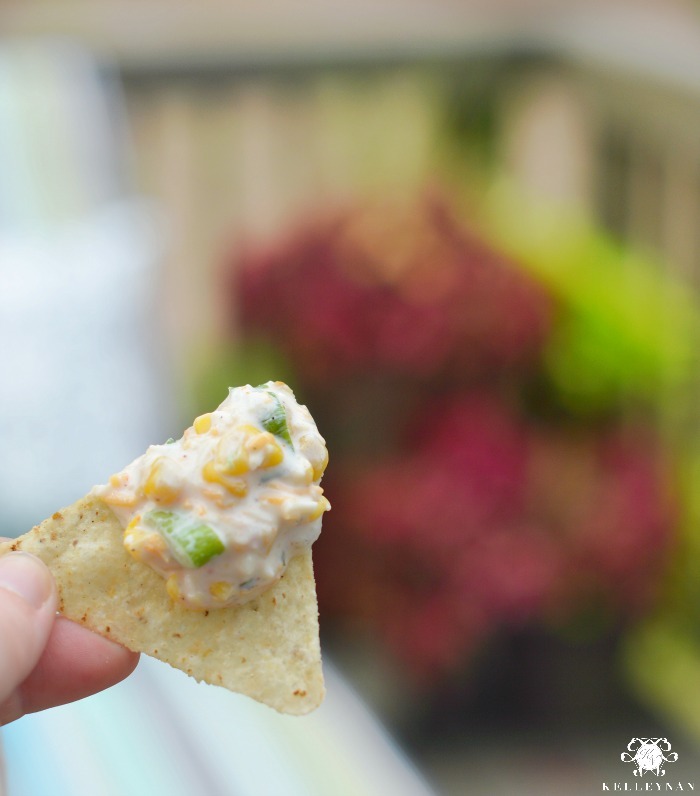 Thanks to my mom, this corn dip is my go-to cook-out contribution and is a fav among several of my friends. Read on for the recipe. 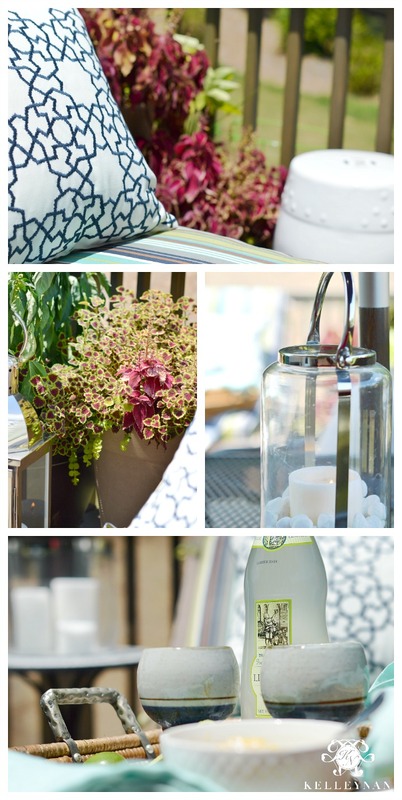 This little corner summarizes the overall feel of our outdoor spaces- casual and relaxed with several light sources for evening ambiance. 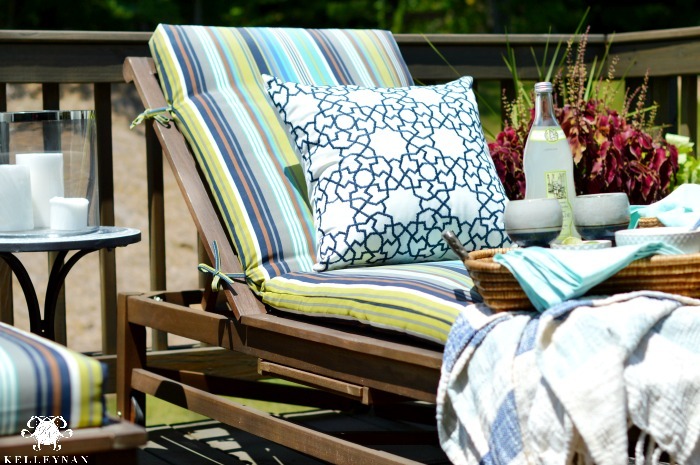 While the inside of our home is more on the neutral side, our outdoor space is filled with fun, summery color and prints. …And just to prove that my plants aren’t dead, I had to include a later in the evening shot haha. We have tried to grow several types of fruits and vegetables, but year after year, the ones that thrive are our pepper plants. 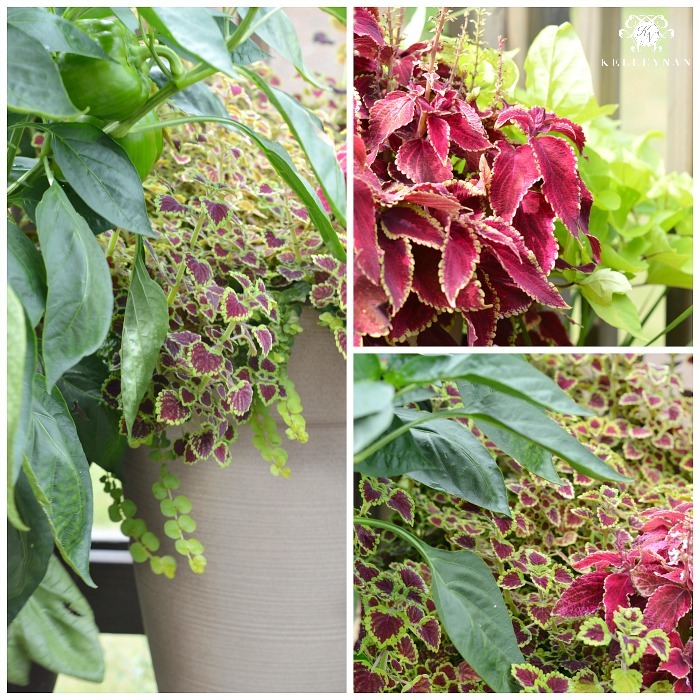 Same goes for florals- I now put my efforts into coleus since they are hearty, thrive in the heat, and are pretty difficult to kill. 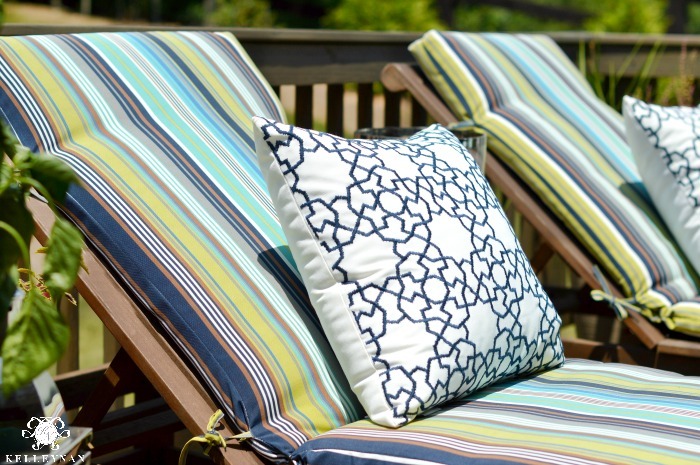 I considered switching these lounge chair cushions for a more subtle solid earlier in the season but am glad I held off; I love how these outdoor patterned pillows from Pottery Barn compliment the stripes. 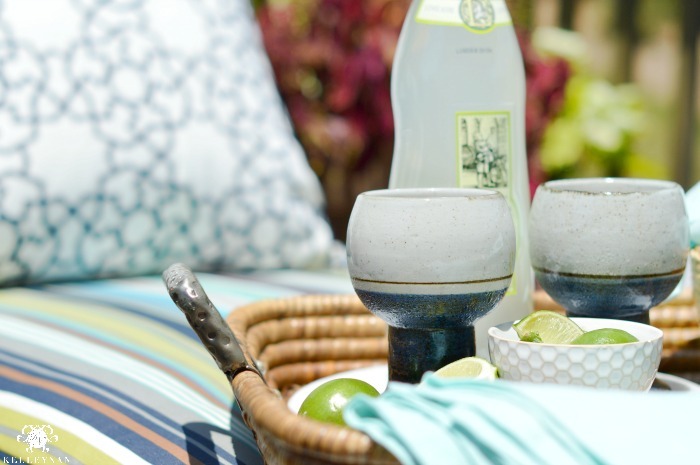 The corn dip recipe isn’t the only thing I got from my mom – she had these goblets since college and I always remember her using them while I was growing up. One had an “accident” a few years ago, but she gifted me the lone goblet still in tact. A few years later, she was able to locate another on replacements.com; I can’t believe she was able to track down such a unique thing but I am thrilled to have a complete pair now. Print, pin, or write this down for your next gathering. Believe me, you will thank me! 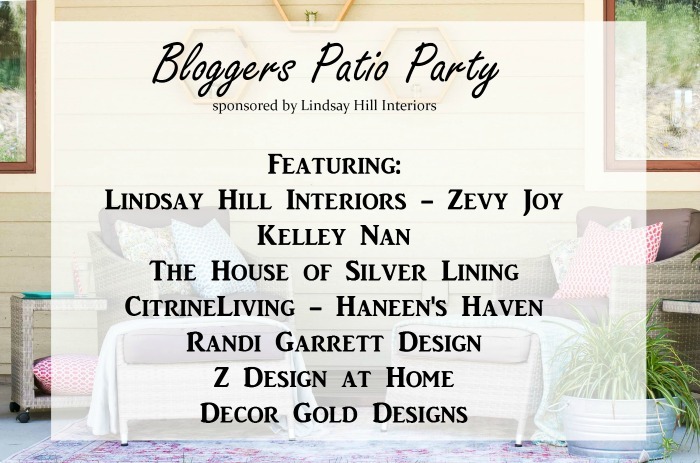 Next, head on over to my friend Shauna’s at The House of Silver Lining to continue the Backyard Bloggers Patio Party. While you are there, you may want to go ahead and favorite her page/subscribe to her blog; I look forward to her updates each week! *Note: contains affiliate links and sources throughout the post. Where product is no longer available, a similar substitute has been listed. Thanks for sharing your home with us. I love these blog-parties. Randi, thank you so so much, my incredibly supportive, talented friend. I just adore you AND that space of yours! 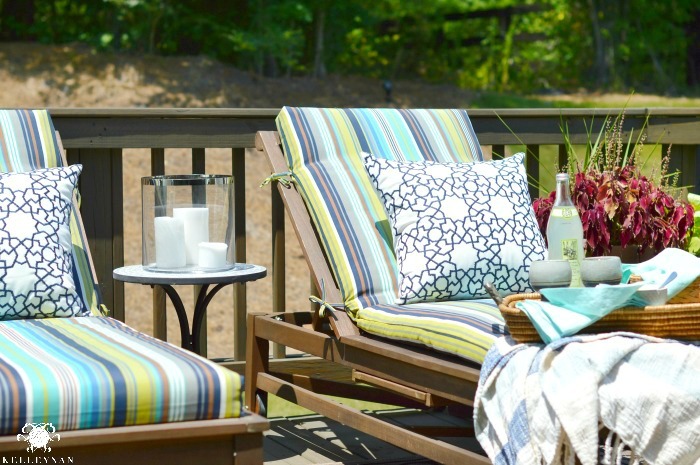 Kelley, your outdoor living spaces are a dream! I LOVE your hydrangea hedge idea – they already look beautiful, but when they become one giant hedge they are going to be dropdead gorgeous! 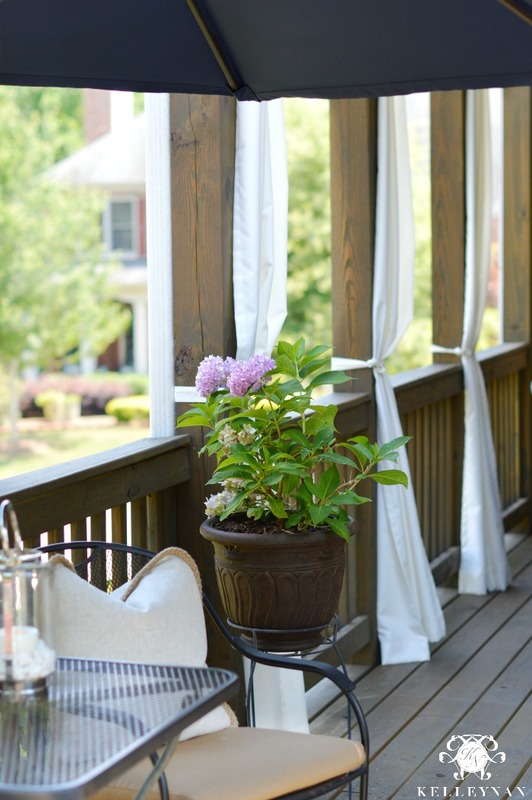 I love all the color and patterns on your porch too – so friendly and happy! You must love spending time out there in your little slice of heaven. Thanks for joining me on this little tour – you are always such a delight! What a treat to hang out out there! 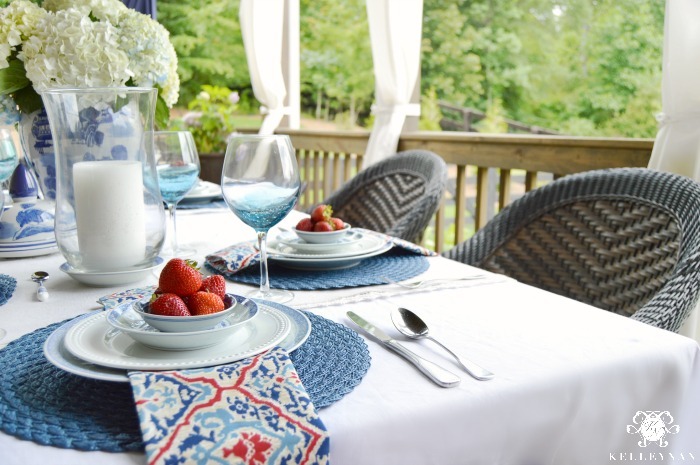 Beautiful outdoor space and that corn chowder looks so good! Kelley! Can I please just come over now to hang out here with you?!? 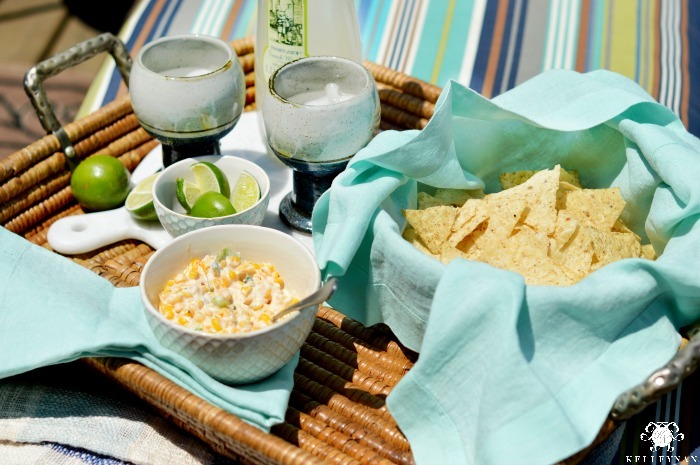 Everything is perfect and that corn dip looks amazing!! 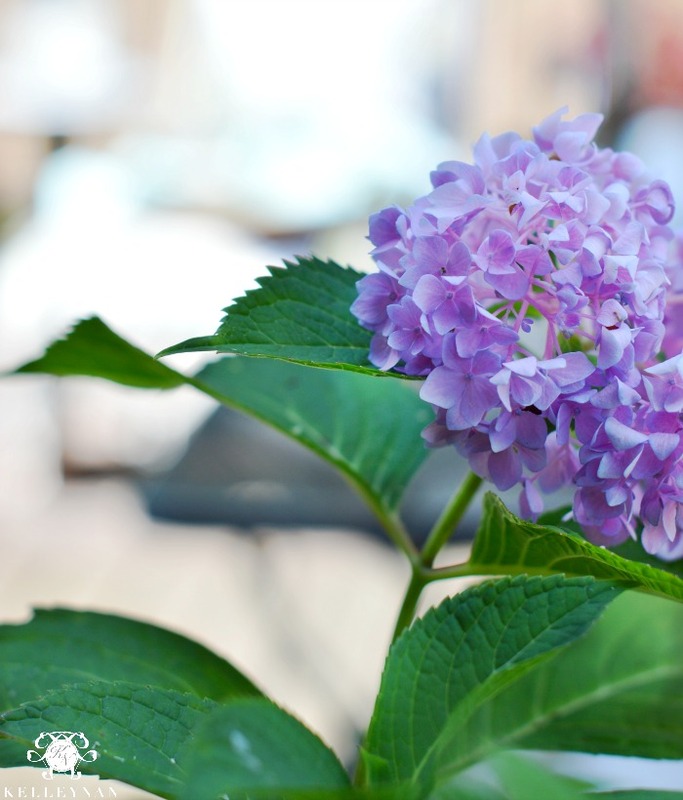 I’m also super excited for you about your hydrangeas…I hope they thrive and give you loads of beautiful blooms this year. Everything is gorgeous as usual my friend!! Happy summer! 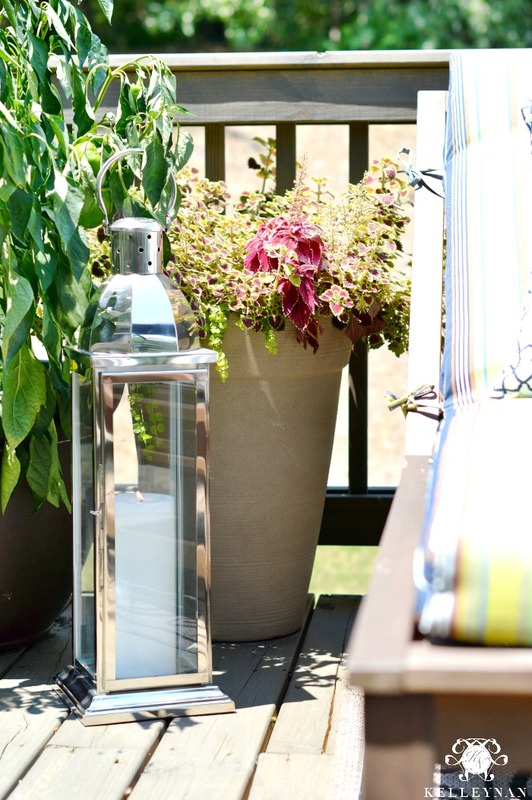 You have such a gorgeous outdoor space! Unfortunately it is nowhere near as warm here in England! Oh how I long for the sun to come out more often! Jenny, thank you so much! I would love to trade with you for a few weeks haha- I love the sunshine but it has been more hot than I ever remember it getting last year! 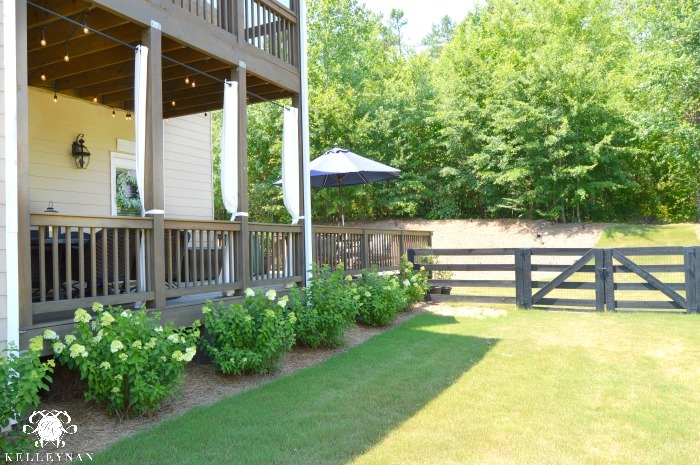 Can I just come over and patio/porch hop? 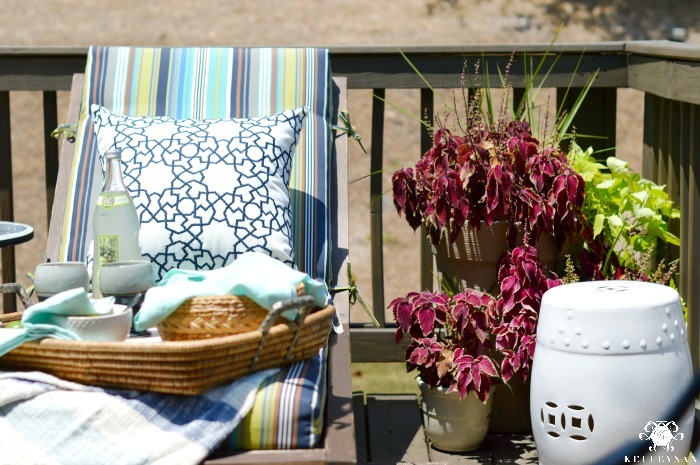 So many beautiful outdoor spaces around your home I can’t just settle on one! 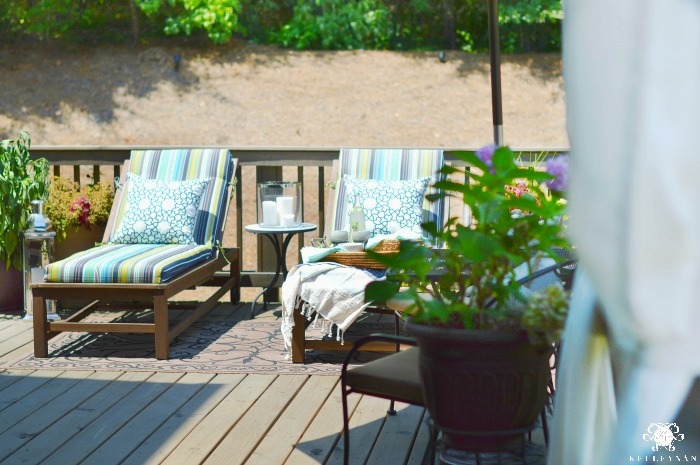 Those loungers are calling my name to come on over and bask in the HOT sun, eating all of your yummy dip and finishing off those beverages. All with a big blonde afro because, you know, humidity. haha! Can’t wait to hug you girl next month! Kelley I just love your style and the pretty colors you used! Gorgeous as always, I also want to eat everything you have set out… looks amazing! Annie, thank you so much! 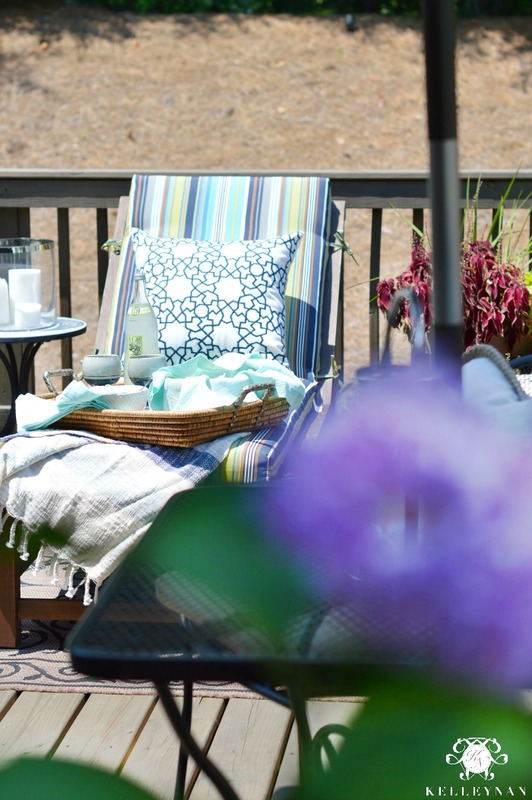 I absolutely LOVE your peaceful patio! All the heart eyes! It is by Green Giant and you should be able to find it at your local grocery store with the corn. I believe it only comes in one standard size. You will LOVE IT!! Please let me know what you think! Every bit is so lovely, even in that hot Georgia heat! You know how much I love that space. It’s one of my favorite places to be! A tip from me is to add 1/2 to 1 whole VERY finely chopped jalapeño to the dip. It adds just the right amount of kick. My favorite is when you are here to enjoy it with me 😉 And yes, awesome tip!! Kelley I love seeing this new-to-me spot and would totally be hanging there ALL THE TIME (well when the sun isn’t blazing hot at least 🙂 – it’s beautiful! 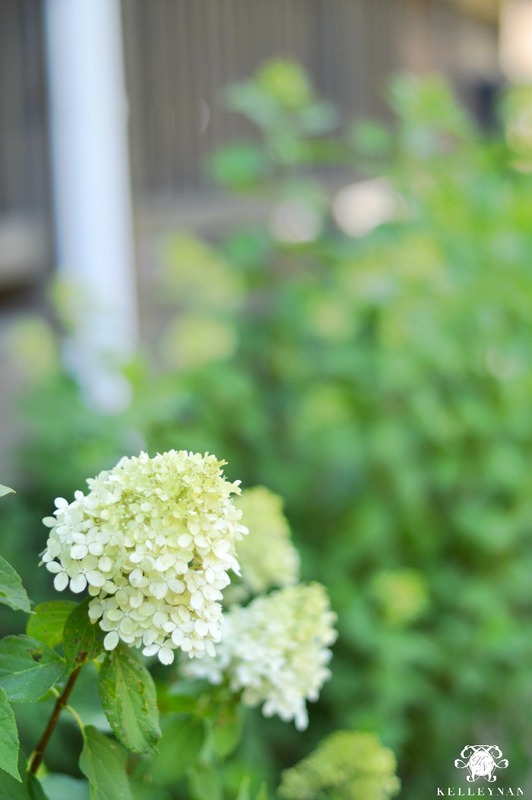 And I’m loving that your hydrangeas look like they’re growing so well – super impressive for new bushes! Kris, please come over! haha- Better yet, come down early from NC for Haven and stay with me the night before 😉 I am so pleased with the progress of my less-than-year old hydrangeas, but they don’t compare to yours yet. I showed yours to my husband and now he has #goals haha! Gorgeous, as always!! Are you serious with that double deck of yours? So good!! Wish we were neighbors!! See you soon, friend!! 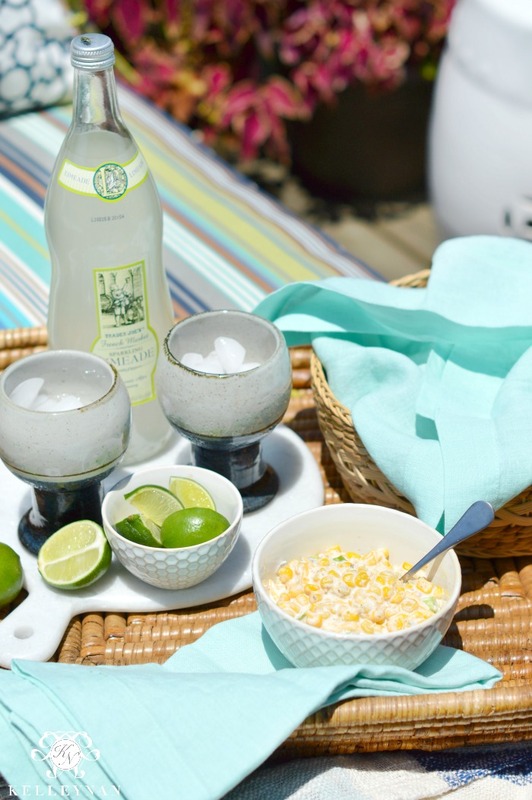 It’s so beautiful and inviting, and that corn dip looks delicious! Thanks for sharing! !